Ich liebe ja die tollen Sylvia Zet Stempel von Whimsy Stamps. Den kleine Drachen fand ich einfach zu knuffig. Super! Der Drache ist ja knuffig. Vielen Dank, dass du dein schönes Werk bei der Stempelsonne zeigst. Viel Glück ! A very cute image, beautifully coloured! I love the flower embellishments too! 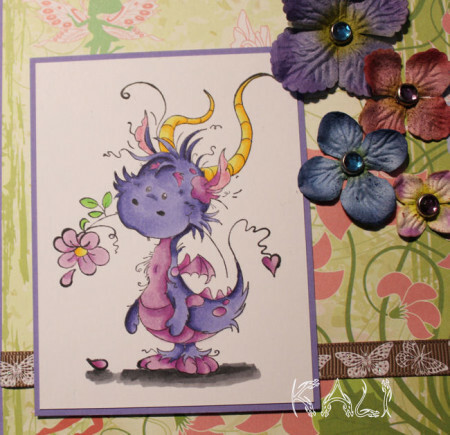 Thank you for sharing your gorgeous card with us at Stamping Sensations. how cute! So glad you came Through ‘The Craft Room Door’ to play! Can’t wait to see more of your talent! This is such a pretty card. I love the colour palette and the cute image. Good to have you with us at Natalie and Amy’s this month. Awe this image is a so adorable. 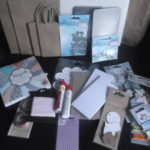 Thank you so much for sharing your amazing inspiration with us at 4 Crafty Chicks Bling Challenge. Hi – just love the colours on this super cute card. That little dragon is sooo sweet! Thanks for joining us over on Crafty Calendar this month. Hope to see you again – good luck!